Divisional General Alfonso Armada Comyn, 9th Marquis of Santa Cruz de Rivadulla was a Spanish military officer involved in both the Spanish Civil War and the 1981 attempted coup d'état in Spain. Heinrich Boere was a convicted German-Dutch war criminal and former member of the Waffen-SS. He was on the Simon Wiesenthal Center's list of most wanted Nazi war criminals. 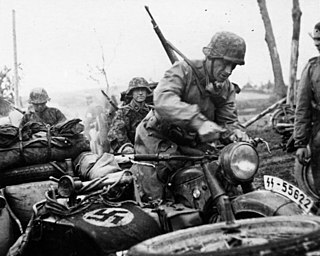 The Waffen-SS was the armed wing of the Nazi Party's SS organisation. Its formations included men from Nazi Germany, along with volunteers and conscripts from both occupied and un-occupied lands. William Alexander "Bill" Allain was an American politician who held office as the 59th Governor of Mississippi as a Democrat from 1984 to 1988. The Attorney General of Mississippi is the chief legal officer of the state and serves as the state's lawyer. Only the Attorney General can bring or defend a lawsuit on behalf of the state. Antonio Ansola Arrieta was a Spanish footballer who played as a Defender. Kiptalam Keter, 80/81, Kenyan Olympic sprinter. Wyndham John Albery, FRS was a British physical chemist and academic. Fernando Martín de Argenta Pallarés was a Spanish writer, journalist, musician and presenter of radio and television. Paul Aussaresses was a French Army general, who fought during World War II, the First Indochina War and Algerian War. His actions during the Algerian War—and later defense of those actions—caused considerable controversy. Hassan Hawlo al-Laqqis was Hezbollah’s chief logistics officer and military commander in Lebanon. Laqqis was assassinated when two gunmen shot him four times in the head and neck inside his car from close range around midnight of 3–4 December 2013. Robert Edward Joseph Allman was an Australian operatic bass-baritone. Pierre Aliker was a French Martinican politician, physician and independence activist. Fred Bassetti FAIA, was a Pacific Northwest architect, teacher and a prime contributor to the regional approach to Modern architecture during the 1940s-1990’s. His architectural legacy includes some of the Seattle area's more recognizable buildings and spaces. The American Institute of Architects (AIA) described his role as a regional architect and activist as having made significant contributions to "the shape of Seattle and the Northwest, and on the profession of architecture." Jean-Luc Benoziglio was a Swiss writer and publishing editor. Angelo Menon, 94, Italian cyclist. Anton Mackowiak, 91, German Olympic wrestler. Neil McLaughlin, 65, Irish Olympic boxer. Cliff Salmond, 85, Canadian Olympic athlete. ↑ "Edward "Babe" Heffron, Another Veteran of Easy Company 2/506th PIR 101st Airborne "Band of Brothers" Passes". Archived from the original on 2014-01-06. Retrieved 2014-01-01. ↑ "John Ewbank, 1948-Dec. 2, 2013". Archived from the original on 2013-12-24. Retrieved 2014-01-01. ↑ Christopher Evan Welch, Actor on Stage and Screen, Dies in L.A.
↑ "Tribute to former Master Professor Wyndham John Albery". Archived from the original on 2013-12-14. Retrieved 2014-01-01. ↑ "RIVERSIDE: Retired Justice John G. Gabbert, civic leader, dead at 104". Archived from the original on 2013-12-11. Retrieved 2014-01-01. ↑ "NFL, Hawaii Harlequins Player Passes Away". Archived from the original on 2013-12-14. Retrieved 2014-01-01. ↑ "Trailblazer Mary Loy passes away". Archived from the original on 2014-01-06. Retrieved 2014-01-07. ↑ "SCHRODER, James Duncan - Obituary". Archived from the original on 2013-12-17. Retrieved 2014-01-01. ↑ "Neil Robson". Archived from the original on 2013-12-19. Retrieved 2014-01-01. ↑ Remembrance of departed colleagues Archived 2013-11-01 at the Wayback Machine . ↑ "Former Lincoln MPP Sheehan dies". Archived from the original on 2013-12-20. Retrieved 2014-01-01. ↑ "Romania's Valeria BORZA passed away". Archived from the original on 2014-02-19. Retrieved 2014-01-01. ↑ "Family: All-Star catcher Herrmann, 67, dies after battle with cancer". Archived from the original on 2013-12-27. Retrieved 2014-01-01. ↑ Birger Gerhardsson 1926 – 2013. ↑ Honorable Herbert F. Travers Jr.
↑ Womensfilmandtelevisionhistory (2014-02-14). "Kay Mander: Documentary Filmmaker and 'Continuity Girl' (1915-2013)". Women's Film and Television History Network-UK/Ireland. Retrieved 2017-03-08.